In February, we showed Ohio lawmakers what happens to the psoriatic disease community when they are subjected to harmful step therapy protocols. The National Psoriasis Foundation’s state government relations team has been working hard to improve your access to health care and treatments. Every year, we travel across the country to visit state capitals and educate lawmakers on issues that prevent people living with psoriatic diseases from getting the care they need. 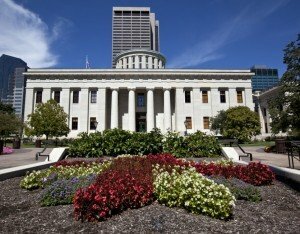 In fact, NPF was recently in Columbus, Ohio to help lawmakers introduce legislation that will curb step therapy protocols. Step therapy allows insurance companies to require patients to try and fail less costly medications until they can receive the right treatment prescribed by their doctors. On Feb. 8, NPF volunteers, providers, staff and Board members joined The Ohioans for Step Therapy Reform Coalition to host the Ohioans for Step Therapy Reform Advocacy Day. We met with lawmakers to educate them on the impact of step therapy and “fail first” insurance policies, and asked them to cosponsor our 2017 step therapy bill. The event kicked off with an opportunity to network over breakfast, followed by a training session and overview of activities. The coalition then hosted a press conference with our bill sponsors and other patient advocacy organizations. This was a great opportunity for NPF because a member of our Board of Directors, Dr. Jason Lichten, and his wife, Rachel, were selected for a media interview with WCMH-TV, NBC’s Columbus, Ohio, affiliate. The Lichtens shared a moving story about their son’s struggle with psoriasis and step therapy, and the clip ran the following day. The coalition had the chance to meet with more than 26 lawmakers, and we appreciated their time and willingness to listen to our stories. By the end of the event, we knew we were successful because we helped members of the Ohio State Legislator understand what happens to our community when they are subjected to step therapy protocols. We’re confident that we secured may co-sponsors from these meetings and that we’ll successfully pass this important legislation in Ohio. Ready to help support our efforts to reduce step therapy in your state? Please contact State Government Relations Manager MaryAnn McCabe at mmccabe@psoriasis.org to learn how you can get involved!